Quarry Park Adventures is the perfect venue for your group! Have an unforgettable company event, field trip, church outing, birthday party, family reunion (and more!) 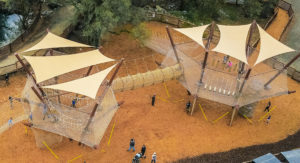 right in the heart of Rocklin at one of the most unique and thrilling outdoor adventure destinations in the country. Complete our Group Booking Inquiry form and one of our helpful Sales staff will get in touch to discuss the details of your event, including special group pricing. Whether it’s for one department or the entire company, Quarry Park Adventures is the best place for a company to have fun. Choose to simply get out on the zip lines together or adventure for hours in the park — your choice! No matter what you choose, your day at Quarry Park Adventures will be one employees talk about for years to come! Get out of the classroom and experience an unforgettable field trip together! 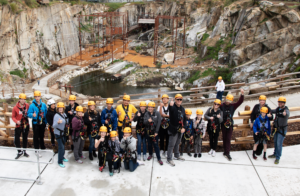 School field trips typically include one of Quarry Park Adventures’ two-hour Packages, but our Sales staff will work with you to determine the best approach for your school group’s goals and schedule. Church outings are so much fun at Quarry Park Adventures! With our staff’s help, plan your next leadership retreat, youth group outing, fellowship night, or offer a unique family bonding experience to your church members. The time spent together on our adventures will be memorable and meaningful for all! 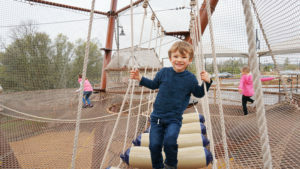 Scouts, sports teams, and community organizations can enjoy a fun filled day at Quarry Park Adventures. Consider booking a day with us to celebrate the end of a year, a season, or simply to bond and enjoy the memories made while experiencing a truly unforgettable adventure together! Let Quarry Park Adventures provide you with a fun and affordable birthday party experience — the best birthday party EVER! Little Adventurers will love time in our Kidz Kove (and parents will love the ease of setting everyone loose to simply have fun together) and older kids (and adults, too! ), will love adventuring in the Quarry as a part of their birthday celebration. Get in touch today, and we’ll help you reserve the perfect adventure for your next birthday party celebration!